We spend our whole lives learning to be independent and take care of ourselves. The thought of turning that responsibility over to others is frightening. Remember when you couldn't wait to turn 18 because you'd legally be independent of your parents? That independence is something we all cherish because it's the core of living life on our terms. As parents age, they begin to see this independence slowing slipping away as their cognitive or physical health deteriorates. 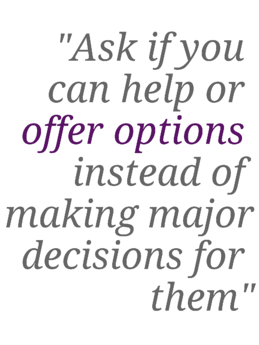 It's essential they keep as much control over their lives as possible, so always try to ask if you can help or offer options instead of making major decisions for them. For example, instead of saying "Don't change that light bulb, you might fall!" ask "Would you like me to check or change any light bulbs?" You can also frame your assistance in the form of a gift by printing a gift certificate for five kitchen cleaning sessions, yard work, or similar tasks that they may be worried about not being able to do on their own. By reassuring them that you enjoy helping you will reassert their independence for as long as possible. Your aging parents see their physical condition deteriorating. They wonder how much longer they’ll be able to do the things they enjoy. Declining health, of course, goes hand in hand with loss of independence and is often a tough subject to talk about. Your parents may reach a point where they need daily assistance with personal care or can no longer safely maintain their home but resist help because they fear they'll lose their independence or home. Your best bet for defeating the anger of aging is to research options and have a candid talk with your folks about the results you've found. The Institute on Aging reports 91 percent of seniors have one or more chronic conditions, so your parents' declining health is not isolated. Physical limitations increase with age, and 65 percent of seniors requiring long-term help rely on family and friends. Another 30 percent use paid assistance, so you should determine what they need now and may need in the future and plan accordingly. Check local resources and insurance policies and discuss their health care needs and possible future needs, so they don't have to worry about "what ifs." Many seniors fear running short of funds. Even those who have been prudent and wisely put aside funds sometimes worry that they won’t have enough. They worry about what will happen to them—and the burden it could put on their loved ones. It's often hard for seniors to talk about money but you can ease into the conversation slowly. Make sure their basic expenses are covered then gradually open the discussion to their long-term financial plans. One conversation opener is to ask how they'd like their affairs handled if they become incapacitated to broach the subject. Make a detailed budget with your parents to reassure them of their financial security. Factor in monthly expenses such as food, utilities, and housing as well as optional expenses such as travel and hobbies. Don't forget savings and emergency money for vehicles, home repair, and similar big-ticket items that may need to be purchased in the future. Once you have expenses and savings covered look at Medicare comprehensive supplementary plans and determine what they can afford compared to what is covered. The cost of health care can cause financial hardship, so planning in advance for a possible medical emergency will ease the worry of running out of money. For most seniors, home is much more than the house they live in. It’s a place packed with memories. It’s familiar. It feels safe, and it’s a huge part of their identity. Like most fears, talking about the subject will help alleviate the stress. Discuss future options such as hiring a live-in companion, downsizing, and senior housing. Be sure to listen carefully to your parents' opinions. Help them research their options, explore the cost of care, and define housing options rather than demand they downsize and move. Your county will have a senior resource division where you can get information on various options. Get a list of local providers for in-home help, live-in companions, and similar programs that will help your parents stay in their home. Research retirement and assisted living communities in your area and take a tour of the three your parents like best. Remind them they are looking at options, not planning a move. Once they understand the different possibilities for various scenarios, they won't have to worry about what the unknown future might bring. The older our parents get, the more of their friends and relatives they see passing on. In addition to being a reminder of their own mortality, there is a genuine sense of loss of relationships. It’s harder to build lasting relationships at an advanced age. Most seniors worry more about losing a loved one than they do their own death and fearing the loss of a caregiver can be extremely stressful. Discussing the possibility is the best answer because it allows your parent to look at the future more objectively. The best way to bring this up may be to talk about your own mortality. Make a Will and a Living Will and let them know your wishes if you were to become incapacitated or die. This will open the discussion of their own plans and let them talk about what worries them about losing a spouse or other family member. Perhaps nowhere is the loss of independence so acutely felt as in the inability to perform normal acts of daily living, such as eating, dressing, and bathing. Older adults fear losing control of their lives and requiring help in these areas is an unwelcome reminder of that. It's important that your parent continue to do as much as possible even if it takes twice as long. Mental and physical activity is also vital because it lessens dependence, so look for senior yoga classes and similar activities that will help your parent build their strength. Activities of daily living (ADL) are one of the things we all take for granted until we can no longer do them. If you've ever had a surgery or injury that makes it hard to do something simple such as brush your hair or shower you can imagine how hard it is to lose that ability permanently. Let them know it's sad but no big deal and help them find a solution if the problem becomes too much to handle alone. Again, there are home care aides that visit specifically to help with ADLs, so there is always an answer to a problem. Giving up the car is a severe blow to seniors. It’s one more act of independence that they have to forfeit. They are no longer free to come and go as they please but have to depend on others. Remember the freedom you experienced the first time you got the car keys in your teenaged hands? That's the independence they fear losing. If it's no longer safe for your parents to drive, you should make sure they have reliable transportation, even if it's just for a spur of the moment Sunday drive. Perhaps the best thing to do in this case is to reassure them that it's no big deal. Most communities have shuttles for seniors so they can still shop, go to appointments, and enjoy recreational activities. Find the options available in your family and your community and help your parents segue into a non-driving lifestyle. If they must rely on a shuttle service, offer to join them for the first few trips until they're comfortable going alone. If they need to rely on family members, make a calendar with a clear rotation and appointments, so everyone is on board with who needs to drive them where, and when. We’ve already mentioned that it’s increasingly hard to establish new relationships and being alone increases feelings of being “unwanted.” Likewise, losing the ability to drive heightens the fear of isolation or loneliness, and both can lead to depression. 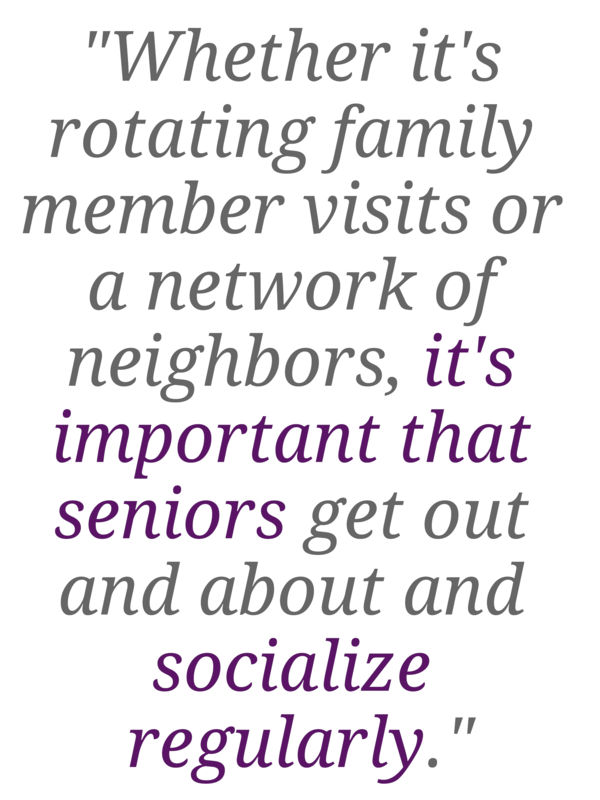 Whether it's rotating family member visits or a network of neighbors, it's important that seniors get out and about and socialize regularly. Look for activities at the nearest senior center and check your county's senior resources for activities and social events they may enjoy. Remember walking into a new group or senior center may feel awkward to them, so it's a good idea to go with them the first few times. Most senior centers offer periodic trips to local sites and events, so go over the calendar with your parents and choose one or two day trips you can enjoy together. By the end of the second trip they will feel comfortable with the group as a whole, and most likely will have struck up a friendship with one or more fellow travelers. We all generally prefer to be around familiar faces. Having a stranger provide care (especially for intimate needs) is extremely uncomfortable. While having a family member as the primary caregiver may be ideal, it isn't always feasible, so if your parent needs outside help you should vet the person carefully and make sure a family member is present until you're sure your mom or dad is comfortable being alone with them. Listen carefully to any concerns your parent has and don't discount their (or your) instincts if something feels "off." If you're thinking of using a company that provides service, verify they do background checks on all employees. If you're hiring someone independently make sure you check their references thoroughly and don't hesitate to have a background check done before you let them in your parents' home. Remember, just because someone is qualified doesn't mean they're a good fit for your parents. Plan to have a family member present for the first few months the aide visits; by then they will seem like a friend and your parent won't be stressed by being alone with a stranger. Most seniors know that they are not as sure of foot as they once were. They know that if they fall or otherwise injure themselves that it will impact their ability to do things on their own. Ironically, the most valid fear comes in 10th place in senior concerns because the Center for Disease Control (CDC) states one in three seniors has a fall each year: this is the most likely fear to come true. Many falls can be prevented so install handrails, remove slipping hazards such as rugs, and take as many other precautions as possible. Check medications for side effects that may cause dizziness and keep on top of your parents' health. It’s important to understand the fears our aging parents face. Often fears grow bigger when they're not vocalized so it's important to discuss them in an informal conversation. You don’t have to talk with them about these things all the time, but it can help temper your reactions when you better understand why they sometimes react the way they do. Remember when Mom used to check the closet because you were afraid there was a monster waiting for you to fall asleep? These fears are your parents' monsters in the closet.